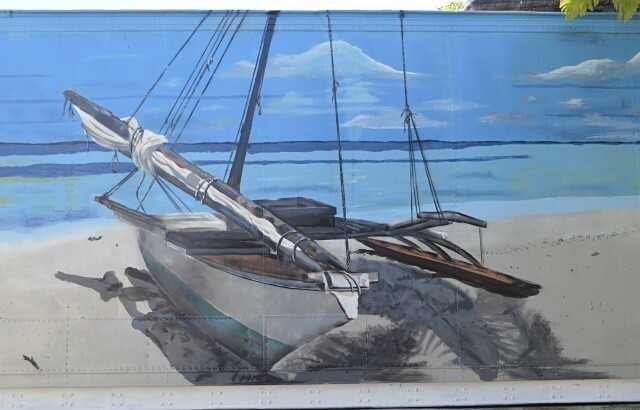 A traditional canoe with a lagoon backdrop features grandly on mural artist Apo Leo’s new work of art at the entrance to Waan Aelon in Majel , but the work’s main focus has an even stronger meaning than this depiction of the powerful Marshallese icon. 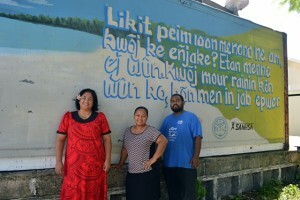 WAM Director Alson Kelen said the painting is “dedicated to the young people in RMI who had to go through a hard time” and took there lives as a result. Likit peim ioon menono ne am, kwoj ke enjake? Etan mene ej wun kwoj mour rainin kon wun ko, kon men in jab epwer. Place your hand over your heart, can you feel it? That is called purpose. You’re alive for a reason, so don’t ever give up. 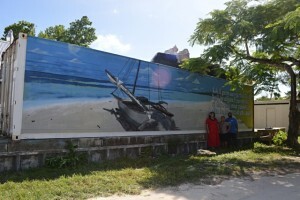 The WAM mural marks a year that Apo Leo has been adding color to Majuro’s walls, with his first works of art showing up in Bilimon’s Alley, Uliga. Since then, Apo has particularly enjoyed engaging youth in his painting. “I love to get people involved in the process,” he said. “But doing the canoe at WAM wasn’t so great,” he said, tongue-in-cheek. “I was pretty much done with it and the trainees and staff started coming over and telling me that this rope was in the wrong place, or that rope was tied to the wrong part… They wanted it to be exact.” And so he did just that.